A soaring contemporary space replete with industrial elements houses a top-flight coffee roaster. : Housed in the developing Armour Yards complex, East Pole is the work of Matt Chesla, Jared Karr and Jules Tompkins. Karr had spent some time in Indonesia, in the east, so the name reflects his tongue-in-cheek sense of geography. The exciting interior design with generous fenestration admitting lots of natural light enhances the experience. A soaring ceiling engages the eye with skillfully arranged industrial elements. The trio sources from importers who get their green coffee beans from single-origin, sustainable producers. Six different coffees rotate throughout the year with one coffee, called "Traffic," available all year. 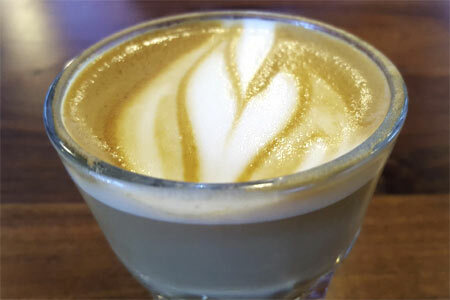 We like a menu that offers "cortado," the Spanish version of caffe au lait. Alternatively, get a competently brewed pour-over. Options include the usual coffee favorites, such as cappuccino. Pastries are available but better get there early as they go fast. The surroundings, the quality of the coffee and the palpable commitment to maintaining standards of barista service all make this a fun stop.